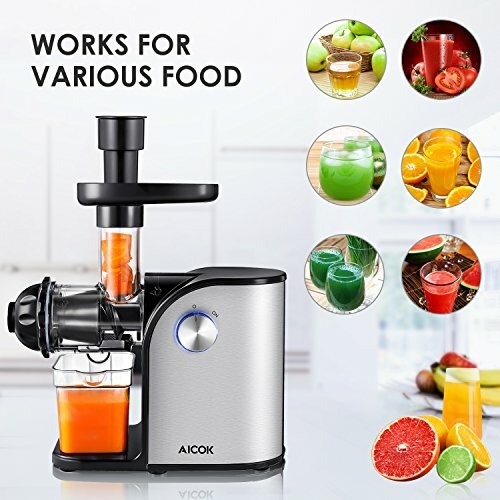 Aicok Slow Masticating Juicer designs with stainless steel body and stainless steel auger, squeezing higher nutritional juices and purer juices than other juicers. ● Low Speed Masticating Technology: Higher nutritional value. Fruit juice is not oxidized and taste good. 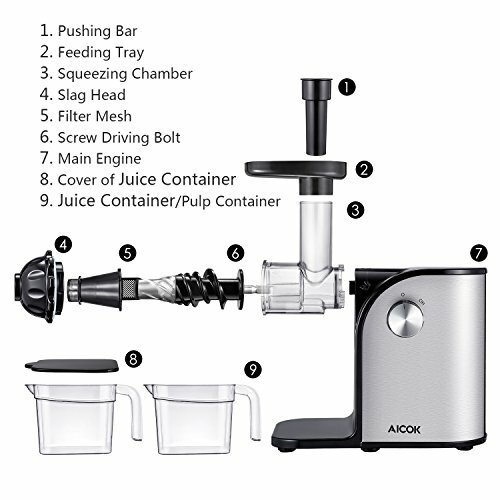 ● Stainless Steel Auger: Extract juices easier than other plastic auger. It can save time for juicing. ● Stainless steel body: Stylish and elegant design, durable and not easy to dirty. 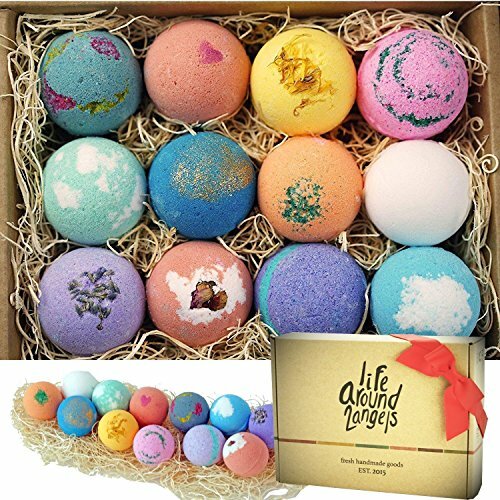 ● Non-toxic components: BPA-free,non-toxic and environmentally materials. ● Detachable parts: the removeable part can be washed by dishwasher, cleaning will not be the trouble anymore. ● Cover for stay juice fresh: drink nutritious juice anytime. ● Easy to assemble and disassemble: Easy to use. 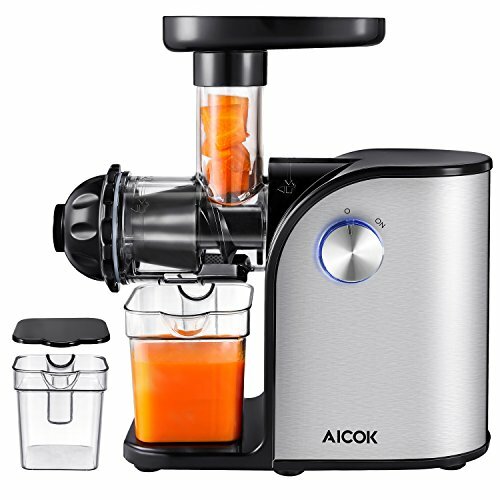 ● Juice can be stored for up to 72 hours without degradation or the juice separation that occurs with other juicers. 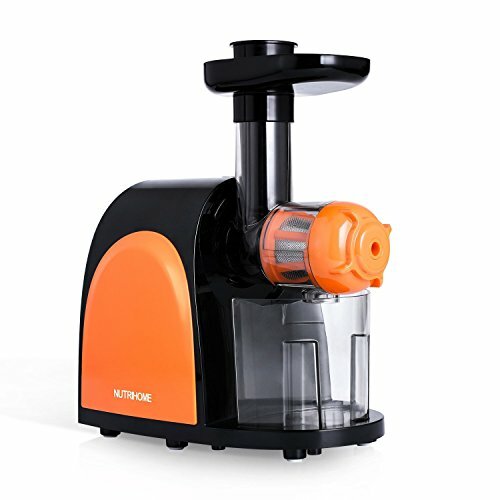 1, Because juicer equips with DC motor, so there will be a short delay when it power.It is a Motor protection system. 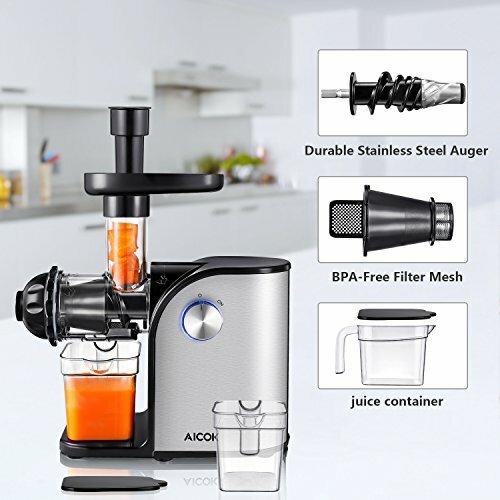 2, Do not put any hard material, large seeds, ice or frozen products into the feed hole of the juice extractor.STAINLESS STELL BODY DESIGN – Our juicer machine with full stainless steel body, more elegant design other than other juicers, more durable and healthy, life longer than other juicers. 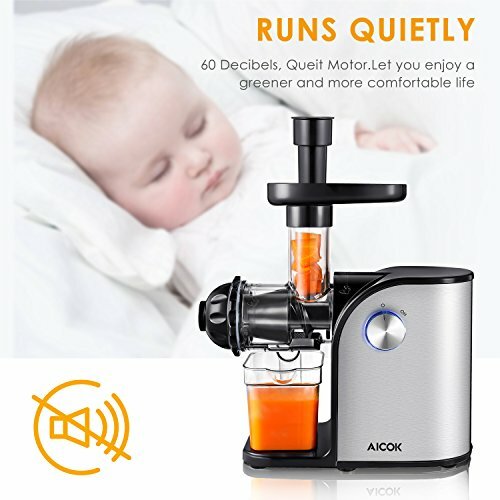 304 highest food grade stainless steel auger extract juice healthier than the plastic auger. 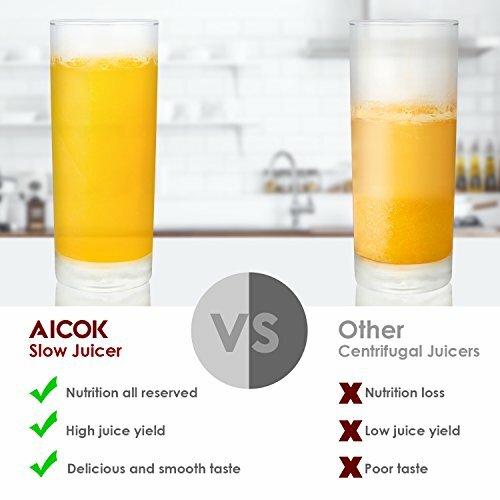 HIGHER NUTRIONAL VALUE – Our masticating juice extractor extracts more vitamins, enzymes, minerals and trace minerals in the juice compared to centrifugal juicers. 80 rpm lower speed means no heat build-up and less oxidation, 90% more nutrition growth. 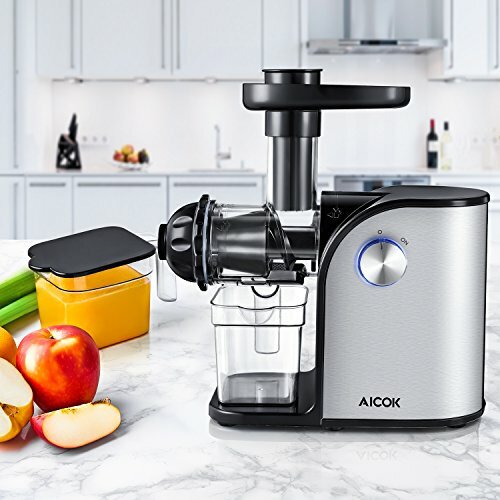 AS EASY AS PIE – Our slow juicer can easy to assemble, operate, and clean, dishwasher-safe parts make cleanup a breeze; 200W powerful DC motor, chew what you want, and run quietly – less than 60 decibels. MORE INTIMATE DESIGN – Include 1*juice container and 1*pulp container. 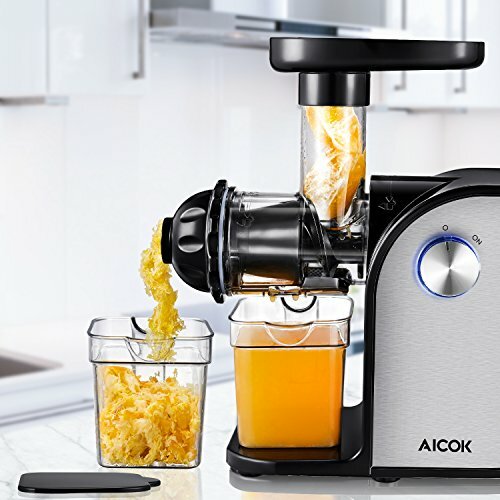 It has a lid for the juice container, it’s useful to store the juice up to 72 hours. 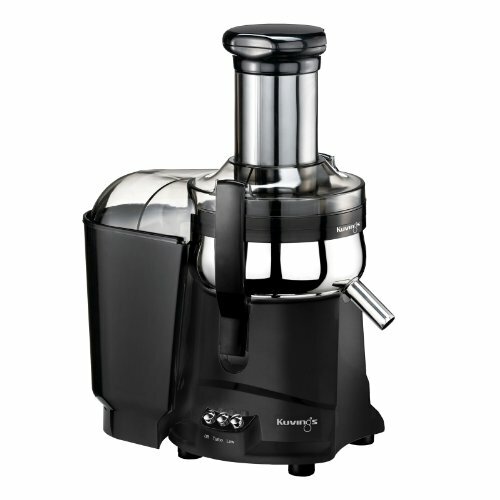 YOUR GREAT CHOICE – Our juicer accommodates fibrous vegetables (celery, ginger), wheatgrass, barley grass as well as many other fruits. 3 Years Warranty.